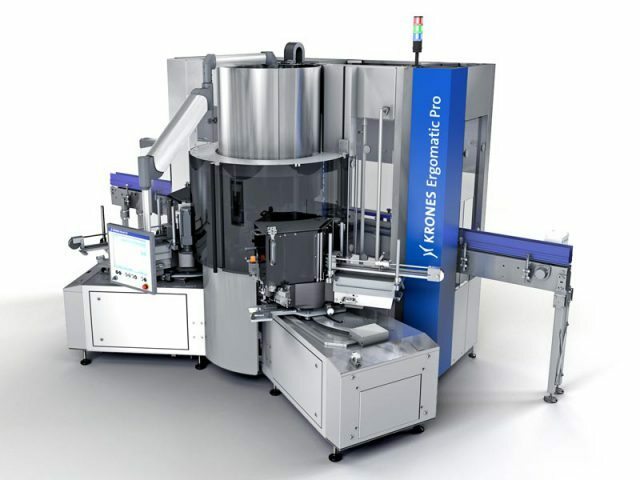 The Krones Ergomatic Pro with a fixed Ergomatic Classic cold-glue station is the company’s new standardized basic machine available in several sizes. It is combined with labelling stations that can either be replaced using docking systems or are permanently installed. This latter category includes the Ergomatic Pro cold-glue labeler. The Ergomatic Classic labelling station has a withdrawable station adjustment feature that ensures optimum accessibility, the swiveling touch-screen is mounted near the station, which significantly facilitates operation and handling. The drive and the control system consist of components from the current range, while the protection concept conforms to the very latest safety guidelines. In order to keep appropriate options available for the future, the station can also be upgraded with weight-reduced or laterally removable handling parts. The Krones Ergomatic Pro offers significantly downsized noise emissions, servo-drives of Efficiency Class IE4, fewer lubrication points.